I'm on a roll with my new crockpot recipes; seriously. 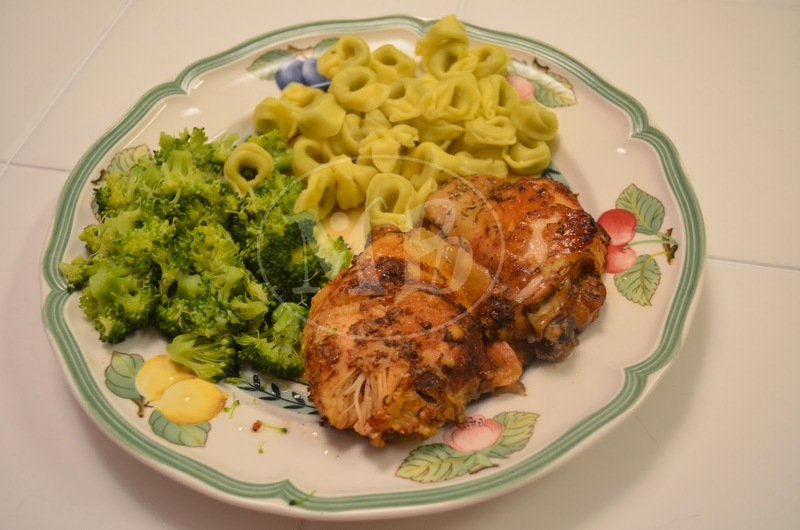 This recipe for Crockpot Balsamic Chicken that I found on pinterest is great! I'm not entirely sure where the actual recipe is because the pin linked straight to healthychefonline.com... not the recipe. Anyway, all my girls (nearly 5, 3, and 1) devoured the chicken. It was tender, fall off the bone, NOT DRY (like crockpot chicken recipes tend to be in my opinion).... very good. The hubby ate it with some hot sauce, but he eats most things with hot sauce, so that's normal. 1 T extra virgin olive oil * so we ran out of olive oil (ahem ahem hubby) without my knowledge; luckily I happened to have some high end olive oil/balsamic vinegar dipping oil mix -- so I drizzled that on the bottom of the crock pot. Combine first 5 ingredients in a small bowl and rub on both sides of chicken; set aside. Pour Olive oil and garlic on bottom of crockpot. Pour balsamic vinegar over chicken. Cover and cook on high for 4 hours. My schedule today was tough for me to be home to set it for 4 hours on high. So I did it on high for about 2 hours and then switched it to low for another 3 or so hours... then to warm while I waited for the hubby. Hope you like it; we did!